The bee hazard icon on EPA's new, strengthened labels for neonicotinoid pesticides helps signal the pesticide's potential hazard to bees. In an effort to protect pollinators from certain types of insecticide applications, EPA has revised the labels of neonicotinoid insecticides (imidacloprid, dinotefuran, clothianidin, thiamethoxam) to include pollinator protection instructions. These special instructions are included in the "Directions for Use" section of the label. 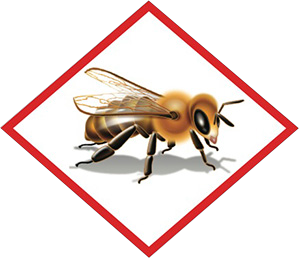 A bee advisory box and icon will appear on the label and contain information on routes of exposure and spray drift precautions. EPA is continuing to review the toxicity of certain pesticides as a result of direct treatment and their extended residual toxicity. The bee hazard icon on EPA's new, strengthened labels for neonicotinoid pesticides helps signal the pesticide's potential hazard to bees. Image courtesy of EPA.